London, England, - The evangelization office of the English and Welsh bishops' conference has launched a program of daily tweets to teach the faith to Catholics throughout the countries. “This is within the spirit of the new evangelization, using new means and methods of communication to share the Gospel,” Clare Ward, home mission adviser for the bishop's conference, told CNA Nov. 28. The service, @YoFtweets, leads its followers through the documents of the Second Vatican Council, the Catechism of the Catholic Church, and books of Scripture. “We think it's the first time that Twitter is being used with a specific catechetical theme in mind; it's not just random tweets, there's a catechetical scheme behind each tweet that's provided every day,” Ward said. The Pope's 2010 visit to England is what has “set the tone for the Catholic Church” in the country in recent years, Ward said. She said the Twitter enterprise should be seen in context with other initiatives, including those reaching out to lapsed Catholics and to non-Catholics. And on the eve of the Year of Faith, Ward reported, the Faith Department printed some 1 million “faith cards” and distributed them across the dioceses of England and Wales. “They are to support to Catholic identity, to give people something to carry to give them Catholic confidence, and secondly to be used as a tool of evangelization, to have that in your wallet,” so that others can see that your Catholic faith is just as important to you as the photos of family kept also in your wallet. “We hope that, especially for very busy people, it will provide an easily accessible daily encouragement to grow in faith and to share it. 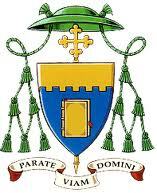 Please do 'follow' and share it with your friends,” Bishop Conry requested.